Some years ago when I was working in a shared studio, we attended a seminar led by WA Belmont BEC founder and facilitator, Carol Hanlon. Carol made it clear that artistic talent will only pay the bills if we learn how to exploit our own intellectual property. The fact is most artists make a living through income streams other than their own art work. Craft has evolved from the early 1980’s when I studied fashion design and then became interested in surface design for textiles. In Adelaide it was a hands-on art based way of learning at colleges like the North Adelaide School of Art, with lino printing, screen printing, dyeing and painting. To learn a new technique we’d attend workshops, read how-to books and subscribe to magazines such as the iconic Textile Fibre Forum. The advent of the internet, digital cameras, image manipulation programs such as Photoshop, CAD, and social media, has opened up a different world of opportunities not available thirty years ago. Moving from a 100% manual labour practise to 100% digital has involved a lot of trial and error. It started with blogging about the art process, then posting up pictures taken with my digital camera. I came across the Etsy website and decided to trial selling online while keeping the gallery outlets going. It soon became apparent that Etsy was more suited to multiples of an artwork, which is impossible to achieve with the hand made techniques I was using. Each item has to be photographed in detail before listing. I’d only used a professional photographer for selling work previously so it was going to be very expensive. It soon became clear that a transition to online selling would cost more than it was worth. The time and space to make the work, then photograph it, list it and then prepare for shipping became more cumbersome than just selling in galleries. The first step to overcome was the one-off surface design process. I experimented with photographing hand painted fabric and uploading to photo manipulation programs to make artworks that could be repeat printed on Spoonflower. The samples looked interesting but I soon worked out the cost of the custom fabric converted to AUD, shipping it to Australia, then cutting and making up and selling online would push the price up. After placing the Etsy shop on hold, and with a growing interest in street art, I started using photography as a new tool for expression. 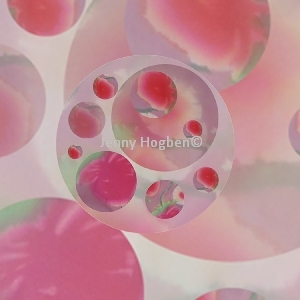 This year I started experimenting with photography for surface design (see previous posts). These designs could be applied to almost anything. 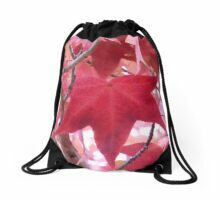 Print websites such as Redbubble and Zazzle offer a range of blank products for custom artwork, and the pricing was lower than any work I could make myself. The problem of product photography was also removed with the use of their sample images of my designs. Drop shipping the items from where they are made lessens the carbon footprint. I completely eliminated excessive use of raw materials in fabric, dyes, paints and water, through made to order. The items at Redbubble are ethically made. The only part of the process I haven’t resolved yet is sourcing all recycled or sustainable materials, though hopefully they can all be recycled. The products that feature my artworks are good quality so should last for years if handled with care. 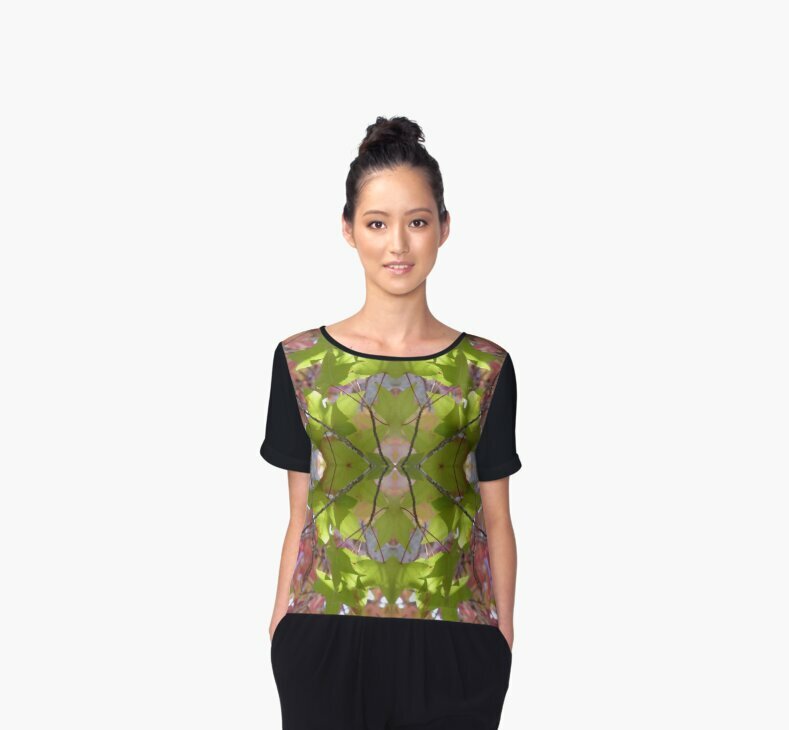 My hope for the near future is an eco print and clothing design site, so I can upload patterns as well as the artwork and have my designs made to order on sustainable fabrics. Come on, Spoonflower! Large scale photographic images are popular now we have the technology to reproduce them on all kinds of surfaces. However, how can the same medium be used for repeat patterns ? Traditional repeats don’t work with photography when the images run over the edge or backgrounds don’t match up. 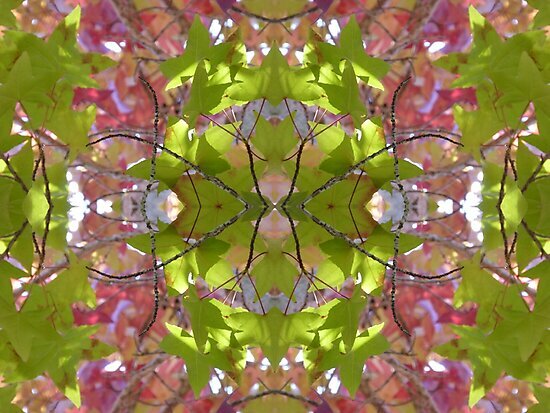 Mirroring the image not only continues the flow of the photograph on all sides but turns it into a pattern as unique as a snowflake. Not all designs look great as a mirrored image, as with the layout of this one where the eye is drawn to a strange centre pattern. An interesting thought about photography as a medium is what works for one purpose may not for another. For example, the last two projects of photography for street murals, the images were of buildings and chairs, so the layout was traditional with the images in sharp focus. Photography for surface design has different criterea . Coming from a textile background with lots of handpainting and dyeing, a sharp focus image isn’t part of the aesthetic, except maybe as a stylised line drawing or lino print. In traditional textile design, an image is printed as a repeat. Only in recent years has full colour, large scale photography been technologically available for textiles (as washable). So how can photography be applied as a medium for decorative surfaces? This is one of my favourite photographs, yet the foreground is dominated by out of focus leaves and a giant dark blob of colour. It probably doesn’t work as either a stand alone print or a textile repeat, yet the tree trunk is in focus just to show it wasn’t a total mistake. The next photograph is what I’m looking for in the perfect surface design image; soft focus with a small part in sharp focus for contrast, interesting shapes, balanced dark and light, harmonious or complimentary colour, evenly spaced across the image. In the continuing quest for creating the perfect eco fabric (short of simply re-purposing existing fabrics) I’m experimenting with digital printing. To date all of my dye and print techniques have resulted in one-only lengths of fabric, with hands on mixing of dyes and inks, fabric preparation, printing, dyeing, clean up, fixing, washing and pressing. The amount of wasted excess dye, water and power use and disposal of salty/soda ash/printing ink infused water made me question if traditional craft methods of surface design is the most eco friendly and sustainable process? I started thinking about the artists and craftspeople who have health issues from constant contact with raw materials. The build up of accidentally ingested dye powder in the lungs, eczema from handling printing inks and chemicals (gloves don’t work with lino block printing!) the fumes from dyeing with eucalyptus leaves, the caustic effect of soda ash, salt, and constant washing by hand. So is there a safe and eco friendly method of surface design? Is the artistic integrity in the hand crafted process of creating the fabric? With competition from countries where labour and the cost of living is much lower, yet the skill and level of craftmanship and design is high, is it financially viable to use hand crafted techniques to create one-only fabrics? A few years ago a friend and I experimented with digital printing on fabrics. A local printer offered sublimation printing (essentially a heat method of bonding dye to synthetic fibres) to placement print our designs. It was exciting to see a digital design that was originally a mixed media collage reproduced on fabric. However, I didn’t like working with synthetic fabrics. The next step was find a digital printer that could print on natural fibre, such as silk and cotton. 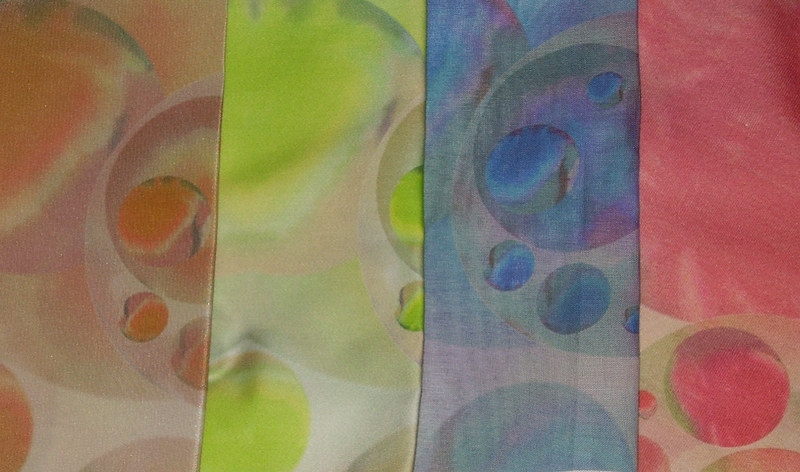 A high quality printer in Sydney was using fibre reactive dyes on pre-treated fabrics. The resulting fabric from other designers looked fantastic, but the set up and printing costs including the special fabrics was too expensive. 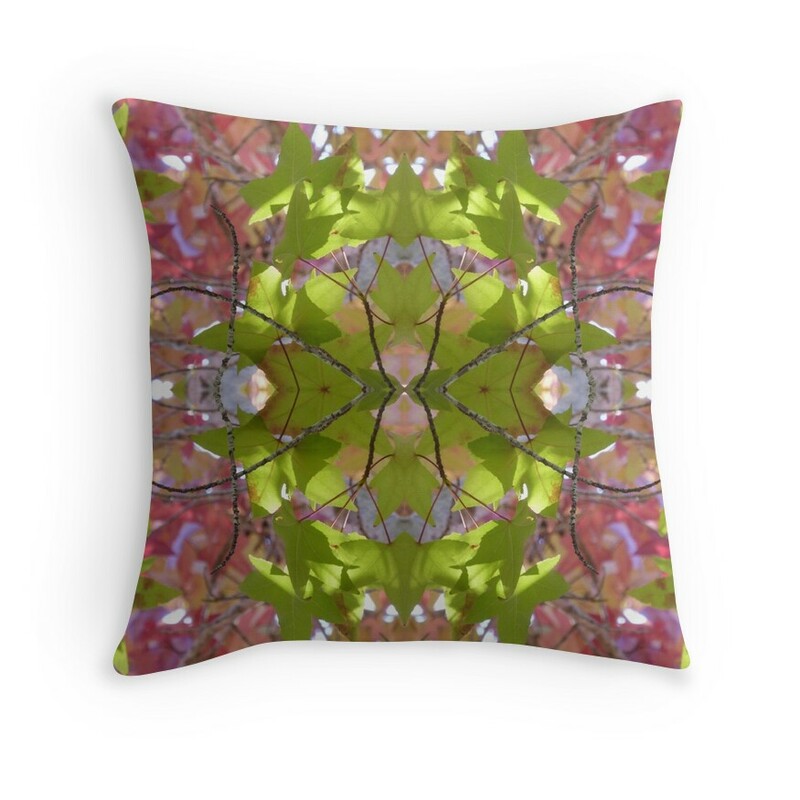 Recently I came across a digital printing website in the USA that pigment prints onto natural fibres, with a selection of organic fabrics and silks. The method seems to be extremely low waste, as only the required amount of pigment is used when printing the lengths, with minimal pre and post fabric handling. 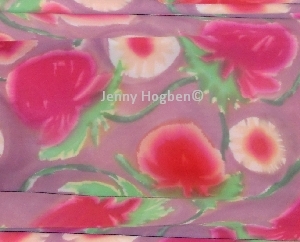 The printed fabric has no odour or ‘handle’ so is like a dyed fabric. The only down side is that the print is on the surface only, so does not penetrate the fabric like a dye, and like all hand printed fabrics, needs care with washing and drying. This method of printing is affordable for studio production, especially compared with the cost of making hand crafted fabrics. Digital printing opens experimentation with surface design. Artwork can be scanned into or created on the computer. Whole designs can be the width and (limited) length of the fabric. 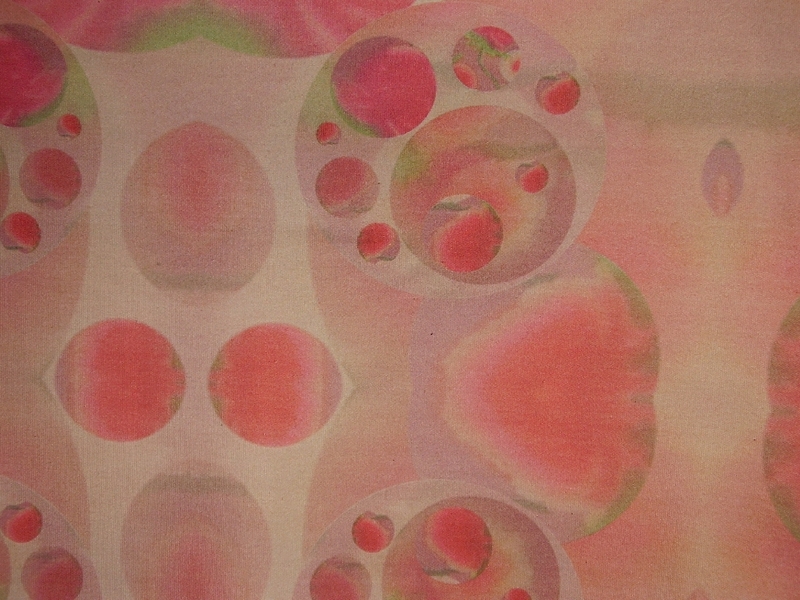 Hand painted fabrics can be reproduced with some experimentation (as shown in the samples, some adjustment is needed with colour intensity vs fabric choice). Even the look of eucalyptus dyed fabrics can be reproduced, though the integrity of the fabric is questionable! See the Useful Links page for digital print sources. After spending a couple of months researching images from horror and science fiction films as inspiration for the Continuity Ritual exhibition, I’ve developed a fascination with fashion relating to death and the afterlife. How perfect to discover (thanks to Peppermint Magazine) Melbourne designer and funeral celebrant Pia Interlandi and her beautiful Garments for the Grave.